The Sudoku has 10 different variants in one program. If you like to solve puzzles, you should pass away the time with Sudoku. All descriptions are in English and Russian. 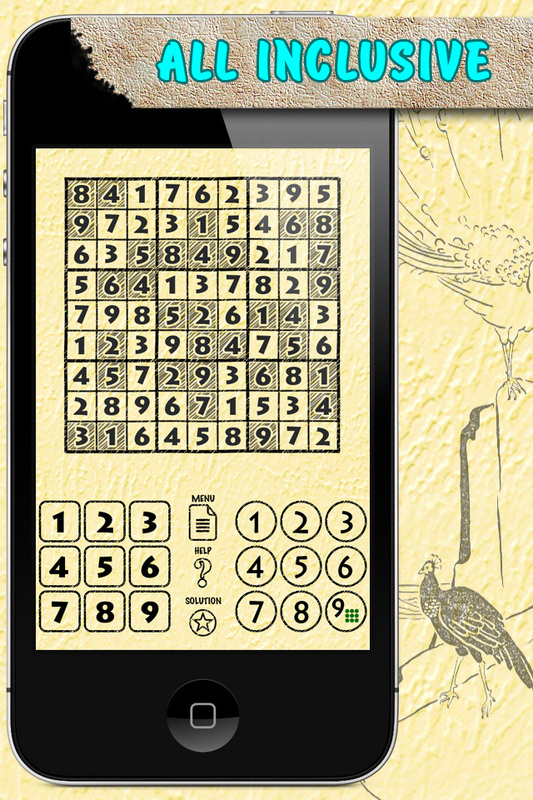 The Sudoku is most popular puzzle game of the twentieth century. The name of Sudoku appeared in Japan in 1984. In our program we included 10 most popular puzzle game for 9x9 board: - Sudoku Classic - Sudoku Kropki - Sudoku XV - Sudoku Geometric - Sudoku Odd-Even - Sudoku Trio - Sudoku Sum Frame - Sudoku Little Killer - Sudoku Distance - Sudoku Skyscrapers Each puzzle has three level of difficulty, plus the opportunity to ask any difficulty level. You have a bonus! You should feel like a genius to solve the Sudokus from newspapers per minute. The program - support Landscape and portrait orientation - support New iPad - has intuitively obvious interface - has pleasant sound effect from nature At any point of the game you can save the image.